I think it's time for us to all get out of our heads again. It's too easy to slip back into "safe" thinking, assuming we know what's best for ourselves when it would be better to check in first to confirm. For example, sometimes the littlest thing makes the difference in your motivation. I borrowed my friend's rebounder and thought it was fun, but no big deal. When I returned it a few weeks later (she wanted to lend it to a friend doing a cleanse), to my surprise I found I really missed it. A silly little mini trampoline, who knew it would turn out to be my toy of choice? So I bought a $59 one from a sporting goods store and am absolutely loving it! Makes me feel like a little kid I guess. Whatever gets you going, I always say! You can get a hard workout on it if you do sprints or a mellower one just jogging in place as you read your novels. If you're bored with your exercise equipment (or ANYTHING in your life) give something else a try. Things change! Stay open to possibilities and see what you end up liking. Ya never know, you might even like bouncing. My new book, No More Zombie Living: Break Free of Feeling Dead & Live the Passionate, Fun Live You Deserve, is coming out next month. The tweaks are being tweaked, the sentences are being sentenced, and I'll share more news about accompanying CDs and other materials as soon as they're ready for prime time. On a related note, if you missed the post on Facebook, check out my Liberation Day article about my first marriage (a glimpse into the end of a huge zombie living phase in my life). I'm so excited to announce the release of Bethanne and Christian's ebook as I've been waiting for it for months. Thrilled to share it with you and give you a sample recipe (and a free bonus) below in the Healthy Recipe section below. If you've never tried an elixir before, this is the best way to do it. I've had the privilege of sampling some of Bethanne and Christian's unbelievably good elixirs before and am so happy that they are now available for everyone to make on their own. You won't believe the flavors you can create with truly healthy natural ingredients and without sugar. Still blows my mind. I read this sentence over and over again when I first saw it last week. Of course you don't... half my mind said. While the other half said, Whaaat? I don't? So many people I know, including myself fall into the mental trap of feeling stuck, riddled with confusion and bound by indecision because we're trying to wrap our brain around what to do. If I can just keep thinking about it, asking other people about it, if I can just get some more insight, more clarity, then I'll figure it out and know what to do. So I think and think and ponder and wonder and think some more. But that's rarely how life works. Thinking alone is not usually the solution to the real dilemmas in our lives. This pattern stops me in my tracks more often than I really want to confess. It's so easy to lean into the Logical Mental Approach seeking to feel smart and wise and sure. What if you needed to fathom every nuance of love before you could love someone? What if you had to understand every single detail of conception to birth before you could have a child? What if you had to know every formula of science and physics of flight before you could fly in an airplane? Not much would happen in this world. We'd spend all day staring at our navels and wondering when someone was going to come along and feed us. Some of us rely on the mind alone far far far too often. And it is as crippling and destructive as any paralysis or muscle-wasting disease and binds us just as surely from taking a physical step and action. Gee I would love to start a business but I'm not sure how or exactly what I want to do. Someday I'll blah-blah-blah when I feel like I'm more of an expert. I can't do that until I get an official degree or certificate so I feel I really know enough. Uh, yeah. It's not looking good. Because if that's your pattern, it's not likely you will ever feel confident enough, strong enough, or SURE enough of your knowledge or self to actually own your work and value. You won't believe enough in yourself to get someone else to believe in you. And the sad thing is, the whole world misses out on your value because you are holding yourself back waiting for a sign, clarity, logic. Breaking this pattern is key to setting yourself free! Our clearest decisions are made when we're balanced - feeling a mixture of emotion, physical sensation/grounding, and mentally attunement. Next time you catch yourself leaning WAY too heavily on the Mental, find more balance by giving your Emotions and Body more air time. Get out of your head. Get in touch with your emotions and body more. Play. Have fun. Do nonsenical things. Listen to music. Dance. Sing. Cry. Run around the block. Connect to the present moment. Be silly. Taste your food. Feel your hips swaying to the music. Watch how a leaf flits across the sidewalk. Take a full deep belly breath. There is wisdom far deeper in our body and in our hearts than our minds alone could ever possess. Tap into it and you'll feel clearer and surer than with any thought you'll ever possess. I'll feel smarter by dancing? Count me in. For more motivation quotes see More Motivation Quotes. What if soda pop was actually nutritious, took minutes to make, was good for you, and still tasted great? Dare to imagine... because it most certainly can be all of those things. Thanks for the imagination, wealth of knowledge, and enthusiastic experimentation there is now a book of these kind of amazing drinks that I'm thrilled to get to share with you. It's written by Christian Bates (of Wild Bar fame) & Bethanne Wanamaker (the Edible Goddess) with the book forward by David "Avocado" Wolfe. It's truly delicious and tastes like an orange soda but without the sugar crash/addiction, calories, or weird chemicals. 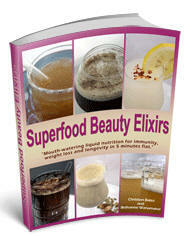 BONUS!For two additional elixir free recipes, see Bethanne's Edible Goddess site. If you're looking to keep weight off through the holidays, deeply nourish your body, break a soda habit, or are bored with your usual fare, this is THE book. I am so thoroughly impressed with Bethanne and Christian and their work. You can get the ebook here. Great job, Christian and Bethanne! Much incredible abundance and love to you all as you expand your vision and heart in alignment with your dreams. Get a free subscription here (top right corner). Sign up and receive Get You Closer to Your Dreams FREE.